I posted a description of Yusuke’s oshiruko before, but this time we had it with shiratama balls, too. Yusuke was singing “shiratama-shiratama-shiratama” all day after eating this. 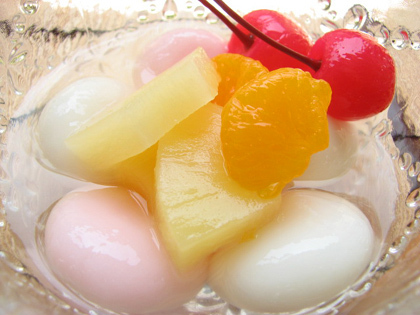 Shiratama-ko is a glutinous rice flour used for a variety of desserts and other dishes (see image searches for some examples). It’s often used in shiruko instead of mochi. To make the balls, water is slowly added to the shiratama-ko in a bowl. On the package directions, it says that the dough should be as soft as earlobes. Yusuke says this a standard cooking direction, but I had never heard it in English. The dough is then kneaded and formed into golf-ball sized dumplings. Next, the balls are boiled in a pot of water. When they float to the top, they’re done! Last, the shiratama is cooled in cold water and drained before being added to the shiruko. We have some of the flour left, so I think next time we’ll eat the shiratama with fruit like this. Another simple stir fry. Yusuke used sesame oil, garlic, ginger, and chicken bouillon (powder) for this mélange of napa (a type of Chinese cabbage), bok choy, carrots, and shrimp. Since sesame oil is so strong, the dish was very flavourful. We also had this clear soup with the remainder of the napa, cubes of firm tofu, green onions, and chicken broth. The picture also shows a glimpse of our new rice: gen-ji-mai brand brown rice. Yusuke found that this was much cheaper than our usual white rice, so he decided to give it a try. The grains are about the same size as white rice, though not quite as sticky when cooked. It is must less “grainy” in texture than I expected. And it’s healthy, too, at least according to the package… To be precise, brown rice has 64% more fibre, 286% more potassium, 582% more magnesium, 161% more vitamin B6, 1021% more vitamin E, and 400% more antioxidants than “ordinary milled white rice.” Impressive. But mostly, I think it tastes good. Recommended. Yusuke revised his spicy eggplant recipe, which resulted in this beautiful creation that rivals the excellent Chinese restaurant across the street from our apartment. Yum yum. This dish is the antithesis to my last post vis-à-vis calories, since the first step was to sauté the eggplant pieces in canola oil—and eggplant certainly does soak that stuff up. We generally buy baby eggplants (a.k.a. Italian) which tend to be more tender, have fewer seeds, and fit better in the refrigerator. When the eggplants were tender, he drained the oil that remained in the pan and then sautéed ground pork (fortunately pick-out-able) and white onions with 1 tablespoon each of tobanjan (spicy sauce) and tenmenjan (sweet bean sauce, not to be confused with anko paste). Tobanjan is extremely spicy, but the tenmenjan brings out a depth in the flavour rather than just a spicy burn. Next came 1 tablespoon each of minced garlic, minced ginger, and soy sauce. He then added in the eggplant and sautéed everything for a while before pouring in 200 mL of chicken broth. He also meant to put in a splash of rice wine vinegar, but since he forgot, we just added it afterward. We ate the eggplant with our tasty new brown rice and miso soup with firm tofu and wakame. I had this meal, accompanied by white wine, on a Friday evening after a good workout at the gym. I was very happy.